We are Mac Specialists, call us before you call the Apple Store, we could save you hundreds of pounds! We fix all models of Macbook and iMac. We repair all models of Mac from Macbook air to the new 5k iMac. Whether it’s a broken screen on your Macbook pro or a faulty keyboard on your macbook air, we can fix it. Last year alone we repaired over 1500 Apple devices many of which were deemed beyond repair. Apple don’t repair devices that are more than five year old, but don’t worry, we do. We don’t mind how old it is or what it has been through. We can fix it. We are the only company in Hampshire able to offer component level repair on you Apple Hardware. This means we can repair a logic board that Apple have said cannot be repaired. We can resolve faults caused by liquid damage. We can fix faults caused by a power surge. We generally have Macbook screens in stock and can normally complete a Macbook screen repair within one hour to 24 hours. We repair all models of Macbook screen incuding Macbook Air and Macbook Pro Retina Displays. Have a faulty macbook keyboard or faulty touchpad on your macbook air? We can fix that for you, it should only take a couple of days to get your Macbook loking and working like new. If your macbook is overheating the it is very important to get it serviced by experienced Mac technicians. 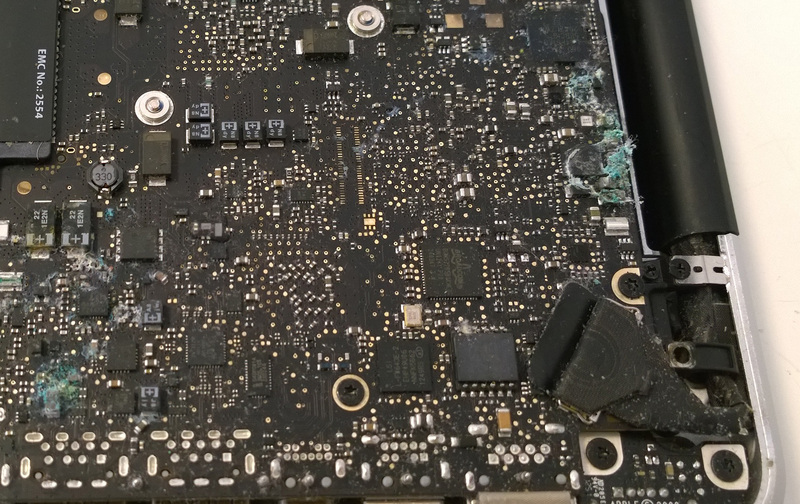 Overheating is very harmful to the logic board and can lead to catastrophic logic board failure. We cannot stress how important it is to use an experienced service like our. So many people come to us after having a friend look inside their macbook only to result in much more expensive repairs. Bring your macbook in for a regular service, at least once every 18 months. Graphics or GPU problems are quite common on Macbooks which is normally caused by faulty graphics processor on the logic board. This is a complex process and should not be attempted by anyone without the specialist equipement reuqired to complete the task. We have all the necessary equipment and experience, we can replace this chip and have your macbook working as good as new. Bring your Macbook in as soon as possible, we can save your Macbook and save you hundreds of pounds in repairs. Time is critical when you have liquid damage to your Macbook. The internal battery will supply electricity to the logic board and burn out many components. Don’t attempt to dry it out yourself, it will only waste valuable time and cost you more. Here’s what can happen to your Macbook in just a couple of days with liquid damage. This was after just 48 hours, the Apple store would write this device off and charge you hundreds of pounds for a new logic board, when in fact all you need is a new keyboard and the motherboard cleaned. it’s a delicate process but our skilled technicians complete this task every day. Whether it’s the 11″ Model or the 13″ Model we can save you at least £100 against a repair at the Apple Store. 11″ Macbook Air Screen repair just £ 199. 13″ Macbook Screen repair just £249.99. If you have damaged the front glass on your Macbook Pro then we can fix that for just £80. We normally have the glass in stock so can complete your repair in under an hour. iMac Hard drive replacement and upgrades are all available at Rocket Repairs. 40% of our repairs are Apple hardware, read our reviews, check our Facebook page and find out why we are the South’s leading alternative repair shop for iMac, Macbook and Apple devices. And remember your device will never leave our shop, all repairs are completed on site. Pop in to our store and we’ll assess your Macbook and give you a rough estimate of the repair cost.